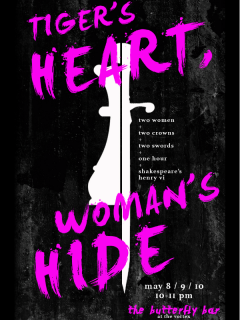 Tiger's Heart, Woman's Hide is a two-woman show that tells the story of Shakespeare's Henry V trilogy through the eyes of its two female warriors. The performance follows the stories of Joan of Arc and Margaret of Anjou as they take up arms and enter the male-dominated spheres of politics and war in to defend their countries, lead and survive. An independent collaboration between Stephanie Donowho and Nell McKeown, this unique production presents a centuries-old text with a fresh and thrilling interpretation.